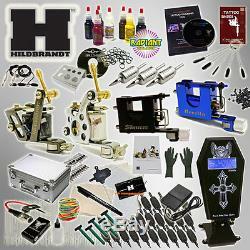 The Hildbrandt Professional tattoo kit system 2. Our newly designed for 2015 Hildbrandt Professional Tattoo Kit 2 is a training system that combines the online support of the Teach Me to Tattoo website, Tattoo Supply & Equipment Crash Course 101, the comprehensive textbook Basic Fundamentals of Modern Tattoo, visual tutorial of the Hildbrandt Training DVD and the hardware necessary to learn the trade. You get exclusive membership to the website Teach Me to Tattoo which features hours of video tutorials, guides and access to their forum with like minded artists in varying degrees of their path to becoming a professional tattoo artist, all sharing with one another what they have learned and discussing in a respectful, supportive and well put together online community. If you are unable to presently get an apprenticeship, the educational value of this kit is quite possibly the next best thing. 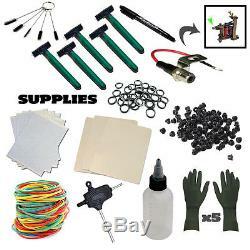 This kit was put together for the purpose of continued use after your apprenticeship. The Hildbrandt machines are easy to work with, easy to tune and run as good as the best on the market. On average, the machines working voltages engage at as low as 3.8v and run at as low as 5.5v. The Hildbrandt Afterlife Dual Power Supply is reliable, rugged and can jack in two guns. This power unit features multiple session settings, touch screen, multiple liner/shader settings, session timer, duty cycle reading and more. All consumables that come with this kit are sterilized with indicator strip and blister packed. They comply with many state regulations in regards to sterilization/indicator strip requirements. There are a vast amount of talented artists out there that use Hildbrandts. Feel free to google us and find our artists gallery that features pictures of professional work done by users of our equipment. Our machines are versatile and easy to modify and grow with you as you progress. Versatility is a key theme to the Hildbrandt Professional Tattoo Kit System. Practice with the non disposable stainless steel tips, grips and sacrifice a few practice needles. Practice on the practice skin or find some pigskin. Soap wash these components and keep practicing with them for as long as you need. Save the pre-sterilized disposable grips, tubes, tips and needles for when you are ready to do skin work. Progression is the second key theme to the Hildbrandt Professional Tattoo Kit System 2. When you are ready, you have the option of sticking with either the disposable tube grips or disposable tubes. If you prefer, invest in an autoclave and sterilize the stainless steel tips, grips, tubes and needles to do skin work. 357 Magnum were standard issue on pre 2008 Hildbrandt Tattoo Supply kits. Versatile and lightweight machine that tunes well for lining. Factory setup as a 10 wrap liner, enough power to push big and small needle groups. Dirty Harry would love this one. Its twin frame design is the. 357 Magnum Hildbrandt Beretta Rotary Shader The Beretta rotary comes with a 2mm bearing installed. 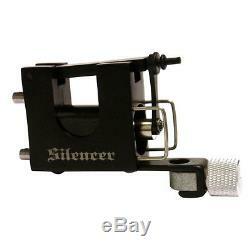 It is better suited for shading than its counterpart, the Silencer, which is for lining. Previous versions of this popular frame design based on the original Swiss Rotary usually featured variations of 1mm, 1.5mm, 2mm, 3mm and 4mm bearings. Despite the wide selection of bearing sizes, most artists that have used this rotary frame design tended to always go back to the 2mm. The reason being that the 2mm was the most well rounded, suitable for both lining and shading. The larger you go, the less stable the machine, the smaller you go, the more likely the machine may cause the needle to snag the skin. This is because even small variations in the diameter of the bearing resulted into big differences in the way the machine ran. During the development of the 2nd version of the Beretta and Silencer, we wanted to maintain a difference in speed performance between the two models but did not want to overdo it. Hildbrandt Silencer Rotary Shader The Silencer rotary has a 1.50mm bearing and is slightly faster running than its counterpart, the Beretta Shader, which is running a 2mm bearing. The Silencer is better suited for lining due to its smaller motor bearing allowing the machine to run faster. 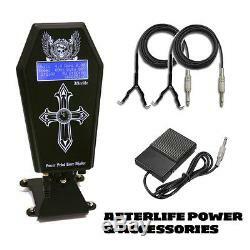 Hildbrandt Afterlife Power Supply Run 2 machines off one powerful multi functional digital power supply. Output of 1.5V-18V, 2 AMP. Chapter One: Getting to Know the Equipment. Chapter Two: Tuning the Tattoo Machine. Chapter Four: Proper Power Supply Output. Chapter Five: Using Flash and Free Hand. Chapter Six: How to do a Tattoo. Chapter Seven: Proper Cleanup and Hygiene. Basic Fundamentals of Modern Tattoo Textbook CR Jordan is a new school artist that teaches the reader how to get into the trade. Speaking from an honest and realistic point of view, CR Jordan covers essential topics like machine building, sourcing of supplies, proper hygiene, machine setups, technique and much more. Well written and complete with diagrams, this textbook is essential for anyone serious about getting into the trade. Exclusive Membership Not only do you get an excellent textbook, you are also getting access to the members section of the site TeachMeToTattoo. See excellent videos, tutorials and discuss on the forum with other artists. Tattoo Equipment & Supplies Crash Course 101 is a comprehensive instruction guide to all of the equipment and components that come with this kit. The guide explains how to set up the equipment, gives you tips on techniques and gives advice on what supplies you may need later on. 7% VIP Member discount card comes with this kit. We have the lowest prices for tattoo needles, tubes, silicon grip tubes, tattoo ink and other tattoo supplies on the internet and you get an additional 7% off of that! Tattoo flash CD is a HUGE compilation of 6000+ tattoo flash archive. Stainless Steel Ink Cup Holder, autoclave able! 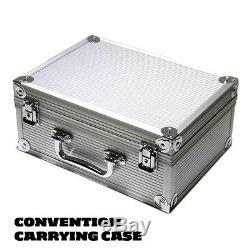 Rugged Professional Convention Carrying Case. Rugged touring carrying case with ample room for everything you need in there. Hildbrandt Premium Pre-Sterilized Needles: 3RL X 5, 5RL X 5, 7RL X 5, 9RL X 5, 3RS X 5, 5RS X 5, 7RS X 5, 9RS X 5, 5F X 5, and 7M1 X 5. 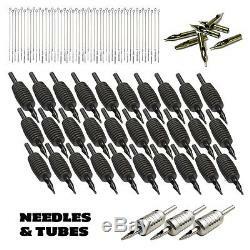 7 stainless steel tips, 1 for each needle type that comes with the kit. To sterilize, you will need an autoclave. Picture is not accurate on tips you receive. Pre-sterilized Blister packed Tube Grips & Tubes. 30 in total, 2-3 for every needle type in the kit. 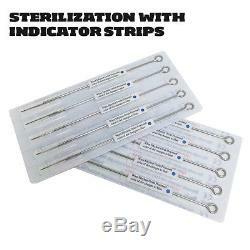 Each one is sterilized with indicator strip, these strips satisfy the sterilization requirements of certain state health codes (the ones that have them that is). Save these for skin work as they are pre-sterilized. 3 Aluminum Grips and tube stems. Tattoo Machinener set to adjust tattoo machine screws. Large pack of Grommets joins needles to armature bar. 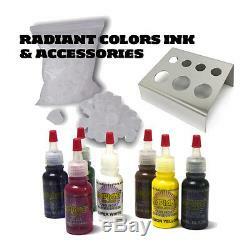 Large pack assorted ink cups. 3 Sheets of versatile and reusable practice skin. Squeeze bottle, may not be exactly as shown. Can be used for green soap or ink. Premium transfer paper, total of 7 sheets. Large pack of Rubber O rings. 5 pairs of premium black latex gloves. Our warehouses are located in the USA and Canada. North American: We are a USA and Canadian company, we help to employ Americans and Canadians. 5 Star Service: We are dedicated to ensuring that your shopping experience with us is nothing short of exemplary. There is a 7 day grace period to pay. The item "HILDBRANDT Professional Complete Tattoo Kit 4 Machine COIL ROTARY Gun Set INK" is in sale since Wednesday, August 19, 2015. 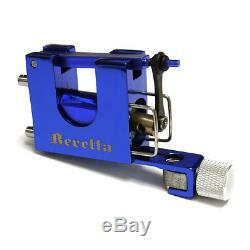 This item is in the category "Health & Beauty\Tattoos & Body Art\Tattoo Machines & Parts". The seller is "auctilliance" and is located in Point Roberts, Washington. This item can be shipped worldwide.